A pencil is a pencil, right? When it comes to fine art pencils, the truth is quite the opposite. Graphite pencils for sketching and drawing are typically marked with an H, a B, or both. These abbreviations are used to indicate the hardness (H) and the blackness (B) of the pencil's graphite. Pencil makers use abbreviations to indicate the type of graphite used in each pencil. Although they sometimes vary by brand, the abbreviations usually follow a basic formula. Pencils are marked with H's and B's: the H means hard and the B means black. These letters can be used alone or in combination with one another, such as the HB pencil. The HB is equivalent to the American Number 2 pencil you've used for years. A Number 1 pencil is the same as a B pencil. Many pencils also have a number associated with them. This indicates the degree of hardness or blackness the graphite produces. Pencils are graded from 9H to 2H, H, F, HB, B, and 2B to 9XXB. Not all pencil makers produce every grade. H pencils are hard and they leave less graphite on the paper. This means that they are lighter. B pencils are softer and leave more graphite on the paper, meaning they are darker. F means Fine Point. This is quite a hard pencil and is easy to keep sharp, but generally a bit too hard for general drawing. The more H's, the harder a pencil is. This means that a 4H pencil is harder than a 2H and therefore also lighter. The 9H is typically the hardest and lightest graphite pencil available. An HB pencil falls in the middle of the scale. For drawing, it's still reasonably hard. The more B's, the softer a pencil is. This means that a 5B pencil is softer than a 2B and the 5B will produce a darker mark. The 7B is the softest and darkest of the common pencils (8B and 9XXB pencils are even softer and darker). The best way to understand exactly what a pencil has to offer is to do a swatch. This allows you to see how light, dark, soft, and hard each pencil is in your set. If you keep your swatch with you while drawing, you can use it as a reference or cheat sheet when deciding which pencil to pick up. Making a pencil swatch sheet could not be easier. Simply grab a spare piece of your favorite drawing paper. Organize your pencils from hardest (H's) to softest (B's). One by one, draw a small swatch with each pencil. Do so in a grid and label each shade with the corresponding pencil grade as you go. When you add a new pencil to your collection, add a new swatch to your sheet. If, at some point, you find that your cheat sheet is unorganized because you've added or subtracted pencils, simply make a new swatch sheet. 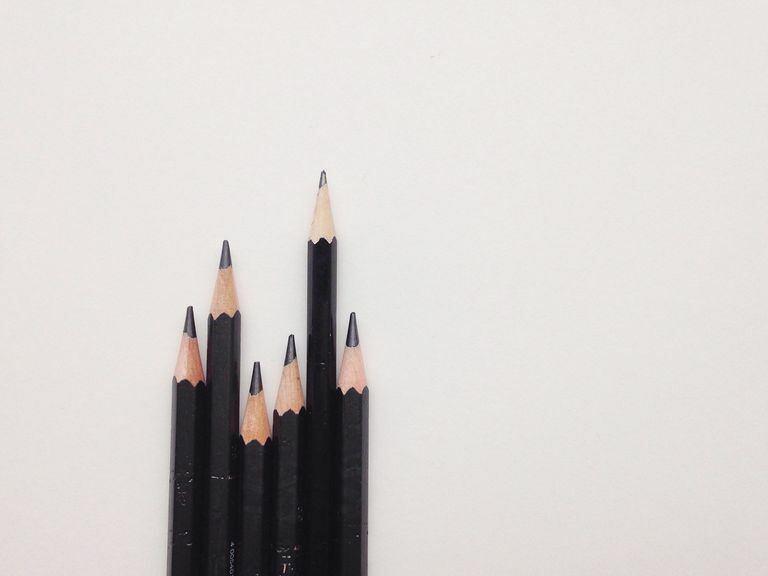 Next time you need to do some deep shading, you'll know exactly which pencil is your darkest. Need to make light cross-hatching marks? Just grab the perfect H pencil for the job. This simple, five-minute task can take the guesswork out of drawing. Which Paper Should You Use for Drawing in Graphite Pencils?